Melissa, the genus name, derives from the Greek melisso-phyllum, "bee leaf," in reference to the flower being a favorite of bees. 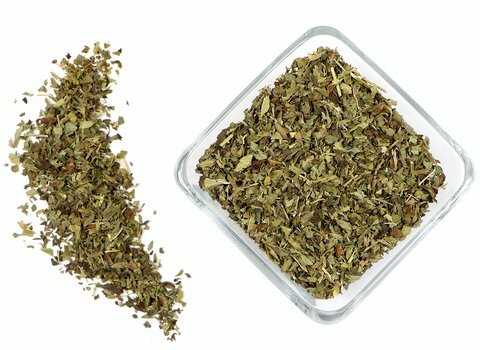 The species name, officinalis, is Latin and means that the plant has long been an official herb of the apothecaries. 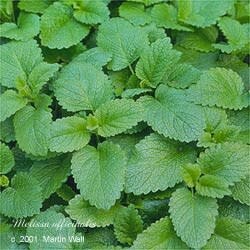 Lemon balm, a perennial native to Europe but widely cultivated in North America, prefers to grow in disturbed areas and open woods. The plant grows to about 2 feet in height and has a four-sided stem. Its lemon-scented leaves are opposite, oval, pointed, and round-toothed. The light yellow, white, or lavender flowers are borne on auxiliary stems. The herb thrives in full sun to partial shade, needs only moderate watering, and prefers well-drained soil. Bees love it; growing lemon balm in the garden will help attract them to the garden. Lemon balm will also repel many pests from the garden. Lemon balm was widely used in ancient Greece and Rome. Avicenna, the great Arabic physician (980 to 1037), said that lemon balm caused "the mind and heart to be merry." Lemon balm clears heat, calms the heart, improves concentration, cleanses the liver, improves chi circulation, and lifts the spirits. German studies indicate that lemon balm's volatile oils help protect the cerebrum from excess external stimuli. It is a good herb for children; a cup of tea before bed can help prevent nightmares and allow for a good night's sleep, and it is excellent to calm the nerves and boost the mood of schoolchildren who are anxious about upcoming tests. Lemon balm is used in the treatment of allergies, amenorrhea, anxiety, asthma, attention deficit disorder, bronchitis, chicken pox, chronic fatigue, colic, colds, depression, fever, flatulence, flu, Grave's disease, headache, heart palpitations, herpes, homesickness, hyperactivity, hypertension, hysteria, indigestion, insomnia, menstrual cramps, migraine, mumps, muscle spasms, nausea, nervousness, Newcastle disease, nightmares, pain, restlessness, senility, shingles, smallpox, stomach ache, and teething. Topically, lemon balm can be used as a compress to treat boils, burns, eczema, gout, headache, insect bites, sunburn, tumors, and wounds. It makes an uplifting bath herb. The essential oil can be added to salves to treat herpes. Lemon balm is certainly edible. The chopped leaves are used to season many dishes and as a garnish. The dried leaves are not as flavorful as the fresh, so use the fresh plant whenever possible. The tea made from the fresh leaves is flavorful and refreshing, with a lemon scent. The herb can be steeped for ten minutes or longer, as it does not become bitter with longer steeping. Lemon balm tea is lovely hot or iced and is suitable for daily use. It goes well with the addition of mint or a squeeze of lime. Lemon balm is used to make Eau des Carmes, a reviving wine made by the Carmelites and dating from the seventeenth century. It was once used as a strewing herb. The leaves are rubbed on wood to produce a lovely shine. Beekeepers rub lemon balm inside hives to attract new bees and keep established ones home. Lemon balm is generally considered very safe and is a favorite herb for children. It can lower thyroid function, however, which is beneficial in some cases but not for those with a hypothyroid condition.